Seven people were seriously injured in a major pileup on B.C. 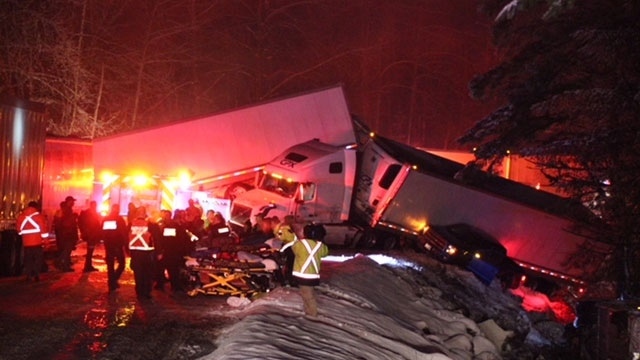 's Coquihalla Highway that involved two buses, two transport trucks and more than 160 people. The chain reaction of collisions happened in Hope, B.C., at approximately 8 p.m. Sunday, sending 29 people to four area hospitals and 136 others to warming centres. The conditions of those taken to hospital ranged from stable to critical, The Provincial Health Services Authority said. CTV Vancouver reports seven people were seriously injured. Samantha Wilbur, director of patient delivery for B.C. Emergency Health Services, told CTV News Channel on Monday that the crashes occurred at the bottom of a slippery hill. “It was a fairly quick response for how challenging this was,” she said. Paramedics say one person was trapped in a vehicle after the crash, and was taken to hospital in serious condition. Both buses involved in the crash were travelling from Kelowna to Vancouver, Greyhound spokesperson Lanesha Gipson said. A bus with 47 passengers on board flipped onto its side in the ditch, and another with 50 on board was also involved in the crash. “We are aware of five reported injuries, most of which were treated and released,” Gipson said. Officials started allowing traffic through in both directions Monday morning, after shutting down the highway all night. Passenger Danielle Grant was sitting near the front of one of the Greyhounds when it turned a corner and she could see two trucks that had collided on the road. “Our bus driver just yelled, ‘Hold on, hold on,’ and he drove into the ditch,” she told CTV News Channel. Grant said the driver helped one passenger who looked “severely injured” while other passengers shared phones so that they could tell loved ones they were OK.
“I want to thank the bus driver for what he did,” Grant reiterated. Another bus passenger said the crash seemed surreal. "There was lots of emotion, lots of panic," said Lacey Shepherd, who was trapped aboard a bus for two-and-a-half hours. "It felt like I was just watching a movie I was in." Passengers can be heard shouting and screaming in a video Shepherd recorded from inside one of the buses at the moment when it was struck by a truck. “Hold on! Hold on! Hold on! Brace for impact!” a man shouts. The truck can be seen coming in at a high speed through the windows of the bus. Jordan Kawchuk, who was on the same bus as Shepherd, said it gave him “goosebumps” just to hear the video she recorded of the collision. “There was this huge crash, I can’t even articulate it,” he told CTV News Channel. He said people were “flying all over the place” when the truck hit, screaming and crying. “We skidded and kind of tilted, hanging off the road a bit, and people were yelling ‘Go to the right, go to the right!’ so we wouldn’t go over,” he said. Another bus passenger described a “domino effect” that began with the transport trucks hitting a patch of ice at the bottom of a hill and sideswiping others, including the buses. Passenger Linda Davies, who was on the same bus, says she provided medical assistance to a badly injured woman at the front of the vehicle. Davies said the woman wasn’t bleeding but had clearly broken some bones. “They had to break the windows and move rotten trees from the front of the bus so they could get a board in to get her out to the hospital,” said Davies, who claimed to have some first-aid training. Kawchuk said he had to get out of his bus by climbing through the window. Several passengers say the transport trucks were travelling at high speed amid slippery road conditions. Photos from the scene show a bus on its side in the ditch, and two semi-trucks hanging partially off the road.